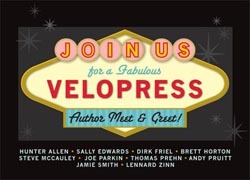 VeloPress and VeloNews Will Host an Author Meet and Greet on Wednesday, 5-6 p.m. It's not every day that you get to meet the top experts and coaches in cycling. Join some of the sport's top experts during a VeloPress Author Meet & Greet at Interbike! Wednesday, September 22, 5:00-6:00 p.m.
- Hunter Allen, developer of TrainingPeaks WKO+ and co-author of Training and Racing with a Power Meter, 2nd Ed.